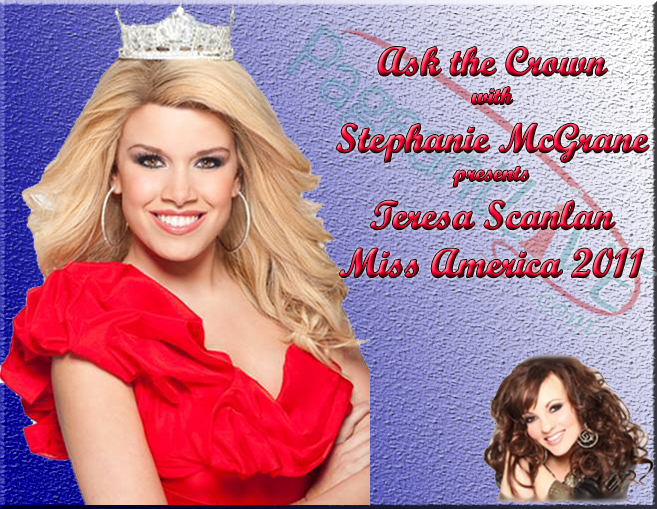 Ask the Crown Stephanie McGrane interviewed Miss America 2011 Teresa Scanlan. She was the youngest to win the Miss America Crown since 1937. 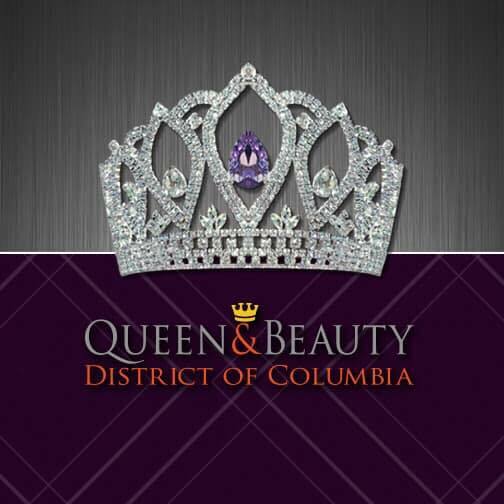 What was the secret to your success of being crowned Miss America? Teresa spoke of how the judges are different in every competition so it depends on the connection you have with them. Despite the fact that some of her judges were completely on the other end of the spectrum of her in terms of religion, politics, etc., she was able to connect with them. If it would have been a group of seven different people, she wonders what the outcome would have been. People try to find some type of magic something that will help them win. Teresa notes that it is more about connecting with the individuals, rather than trying to change something about yourself. She believes that, "God's will will be done in the end and if it is meant to be, it will happen". 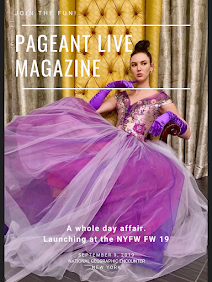 What is the secret of going into a pageant interview? What can people do to connect with the judges? Teresa believes there are elements you can’t control or plan for. Often times contestants focus on themselves and walk into an interview thinking, “I want them to like me” and “I’m going to tell them how great I am”. Judges can be turned off by that type of attitude. She stated the importance of the judges needing to know that you care. Remember the saying, "people don’t care how much you know, until they know how much you care". Knowing that the judges were very different than her, Teresa focused on gaining a connection with them and making sure she explained her positions well. Teresa reminded the viewers to always take into consideration the audience that you are speaking to. How were you feeling as they began naming the runners up? Going to Miss America as the youngest contestant, Teresa thought, "there is no chance (of winning) so my goal was simply to do my best and to try and set a record for Nebraska". Through the prelims she wanted to make Nebraska, her directors, family and friends proud. She won talent the prelim night and Nebraska had never won that award, so she was pleased with that. Then, she was in the top five and she was so excited to have made it that far. Teresa thought she was going to be called 4th runner up. When the 4th runner up was called, she thought she was going to be 3rd runner up! She was thinking about her homecoming and going back to Nebraska because they had never had anyone in the top 5 before. Then she was holding the 1st runner up's hands. She could not believe she was going to be first runner up to Miss America. She was thinking how excited everyone was going to be! She thought there was no way the judges would give the responsibilities of Miss America to a 17 year old. When they called her name she didn't know what to think. It was so unexpected. Teresa said it didn't really sink in for about two weeks. What did you do to prepare for Miss America and how long in advance did you start to prepare for the competition? Teresa said everything she was doing her entire life was preparing her for Miss America. She did not grow up thinking she was going to be Miss America. She was never interested in competing in a pageant. She wasn't really good at one particular thing growing up but she was diverse and involved in a variety of activities. When Teresa did become involved with the Miss America Organization, they liked the fact she was involved with her community, excelled at academics and was a well-rounded person. Teresa said, "you need to have something to share, something that you are passionate about, that will always make a difference." What was your year like as Miss America? Teresa said Miss America is like the world’s largest internship. The day after she won she boarded a plane to New York City and from there hit the ground running. She was on a plane every other day. In one year, she packed in enough experiences that most people do in about 35-40 years. 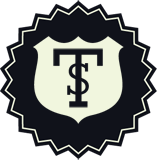 Teresa traveled 200,000 miles, across 36 states and 5 countries. Other than being home one week for Easter and two weeks for Christmas, she was on the road 24/7. Teresa spoke of her title as hard work and a full time job. There were 16 hour days of walking in high heels and 6 hour long autograph sessions. Since being Miss America is so much work, Teresa told us that "you have to be passionate about it". The title gave this lovely 17 year old, small town girl the chance to reach so many different people, speaking to groups as large as 20,000 people. One of her highlights was being able to speak at the American Legion National Convention in Minneapolis just before President Obama. At one point you were interested in going into politics, is that something you still want to do? Teresa is currently working towards her undergraduate degree in government at Patrick Henry College. Her dream is to follow that with law school at Harvard. She would love to represent the state of Nebraska on a state or federal level. This has become even more of a passion of hers since representing Nebraska and becoming Miss America. How do you feel about the Miss America Pageant moving back to Atlantic City? Teresa is SO excited for the Miss America Pageant to return to Atlantic City! She is jealous it wasn’t held there the year she was crowned. Teresa said it is important to hold onto tradition and that is something that sets the Miss America Organization apart. 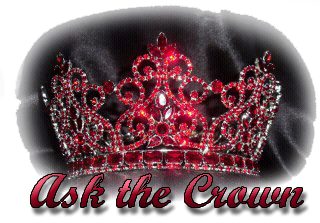 What advice do you have for the ladies who aspire to become Miss America? Teresa believes that sometimes people think that a specific event or crown is going to change who they are, how they act, how they speak, how they dress, and it won't. Winning Miss America is not going to change you and make you become the best person in the entire world. If you are not acting like Miss America everyday, you are not Miss America. There is only going to be one Miss America, and the rest of the ladies will go home and continue to represent their states. In those positions they should be just as much like Miss America as if they had won the title. Teresa would like to see the state titleholders represent the organization better than if they had won Miss America. If they have a state crown on their head they are still the face of that organization. You were Miss America t the age of 17, where do you go from there? Winning Miss America wasn't on Teresa's bucket list. The title was a detour, so now she is back on her path that she had planned, only with more resources. She is attending college, followed by law school, with plans of going into politics or criminal prosecution in Nebraska. Her bucket list is as long as the dictionary! Teresa is also working on her personal trainer certification and plans to compete in a fitness competition. She feels that some people let one thing define them and they never move forward, stifling their growth. Teresa has found that it is important to set goals for the day, week, month, year as well as lifetime goals. Tell us about you pageant coaching business. As Miss America, people often asked Teresa for advice. Wanting to give more extensive advice to contestants, she has created a Facebook page called, Gold Standard Coaching. She posts a verse or vocabulary word of the week, interview questions, tips on physical fitness...all the things that contestants need to focus on for competition. How do you conduct your coaching? Teresa coaches in person, by phone or by Skype. She knows the importance of staying connected with her clients, especially when they are at a competition, and does so by phone, texts and emails.